Reading last Tuesday’s Daily Mail article about former Scottish rugby star Thom Evans, I found myself shocked at how closely the doctors literally held his life in their hands during­ his major spinal injury. These amazing doctors, positive family members and supportive fans and friends helped Evans find his feet again. As I read the footballer recalling the agonising memories from the tackles that caused the injury, the emotional and physical stress he experienced, and his amazing fight for recovery, I was aware of how important the mental state and support network becomes to any athlete. In his third and final knock for the game, Evans remembers ducking his head in an effort to protect his lip from re-splitting. 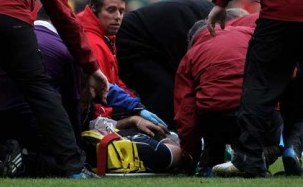 “Who knows if the serious accident would have happened, as my neck and back would have been at a different angle in the tackle.” Falling to the ground Evans immediately lost all sensation to his body. Not being able to move he watched the ball slip and spin out of his hand. He had dislocated his spine, resulting in temporary loss of feeling to his hands and feet. Evans felt like he was dreaming as the Doctor held his back and neck in place to avoid movement on the field. Evans recalls, “I thought I would die there on the grass wearing my Scotland shirt. After 3 long, numb, minutes the pain finally kicked in. Evans suffered through the ‘earth-shattering’ pain without morphine or painkillers at the team Doctor’s discretion. He was later told it was to keep him aware of the seriousness of the pain so he wouldn’t shift his neck. The seriousness and fragile state of Evans spine meant even the slightest movement would have snapped his spine, killing him. Once in hospital an MRI was carried out, where the Doctors were able to pinpoint the dislocation high up Evan’s spine behind his throat. Evans family was in the hospital with him as the doctor informed him of the surgery required. Because Evans back was so badly injured, the procedure for surgery was to make an incision through the front of his throat, shift the spine back into place as the vocal chords were hung to one side. After 3 hours in the operat­­­­­ing theatre Evans came out to find it was successful, however as any recovering patient or athlete knows, the recovery can often be the hardest part. Evans was dealing with the shock of the accident, the painful aftermath of surgery, and the haunting question of whether he will be able to play again. The recovery becomes a physical and mental battle. The doctors had braced the area behind his throat with metal plates and screws to support his fragile spine. The pain was still excruciating for Evans and the Doctors decided to operate a second time to help speed up the healing process. Desperate to go home to Glasgow, Evans was up out of bed one week after surgery. Each day, walking one more step than the other, by the time he was walking to the end of the ward and back he knew he was ready to go home. Before he knew it, Evans was walking then running around Glasgows Kelvingrove Park. His recovery was exceptional, displaying the mental strength and determination required in professional sports. Evans had clearly acquired and was utilising these techniques at a time where he wanted a fast and strong recovery.